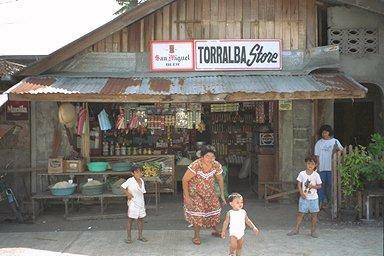 The Sari Sari Store is more than a shopper's convenience; it is a way of life. Sari Sari Store your one stop shop. The Sari Sari Store is as Filipino as the Jeepney and it plays just as important role. Where the Jeepney provides low cost transportation to just about every nook and cranny throughout the Philippines, the Sari Sari Store provides single use packaged goods, or tingi, allowing everyone to purchase goods within their budget. What is a Sari Sari Store? The Sari Sari Store is your urban and rural convenience store, but it is much more than just a store that sells single packaged items. It is a place of congregation, where you can catch up on the local chismis, rumours and gossip, it is probably where most chismis originates. The word Sari Sari is Tagalog for "various kinds", which is true of the sari sari store and there "various kinds" of items for sale. It is not unusual to see a group of people, generally the women playing tong its out the back, tong its is the most popular card game in the Philippines. Typically a sari sari store is attached to the back of the owners home or can be freestanding, is sometimes barred at the front and open seven days a week and is extremely important in rural areas. What can you buy at a Sari Sari Store? You name it and you can pretty much well buy it in a sari sari store. One of the most unique things about the sari sari store is how you can purchase single items, the sari sari is not a place for bulk purchasing. The rural areas are poor, the sari sari stores allows people to purchase on a needs basis singular items, for example instead of purchasing a bottle of shampoo, you can purchase a sachet for maybe one or two shampoos. It is not just shampoo that you can purchase as single items, cooking oil, toothpaste, sugar, salt, charcoal, lollies, even single cigarettes can be purchased tingi. Now to save on space, most of the items are hanging from the ceiling as you can see in the following photo. I use to purchase San Miguel beer by the case and leave it at my local sari sari store, of an evening when I would come home they would ensure that there were three icy cold San Migs waiting for me, now that's service! The single sachet's assist Filipinos to budget there peso's. 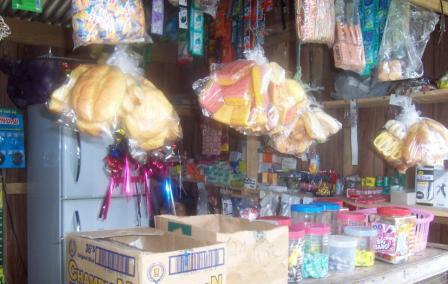 The cost of transport to major towns to purchase items from larger supermarkets can be beyond reach of rural Filipino's and as there income is so low the majority would not be able to afford the bulk items, hence the necessity for the sari sari store to enable small or single item purchasing. Sari Sari Stores would appear to have been around forever, well maybe not quite forever but there existence has been traced back prior to the arrival of the Spaniards in the 1500's. Operating a sari sari store is a way of life, it provides the community with the opportunity to purchase items in singular form on a needs basis. It is the ultimate discovery of practicality, a social gathering during morning, noon and night and what's more is there is no shortage of sari sari's, they are literally everywhere.